I finally retreaded my golf shoes. I’ve started to notice errant shots because my feet have been slipping. Every spring I go through this. I lose power and accuracy and being the genius I am, I figure it out about two months too late. So a couple of days ago, I replaced my old spikes with a set of new Champ Scorpion Stinger spikes. 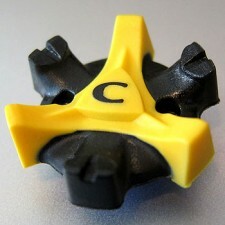 The Stinger is made from a soft “durometer” TPU plastic. This plastic can somehow provide comfort and padding, yet is still durable. The forks of the spikes have a spring action, called spring-flex by Champ. what I like about that is that the shoe can sort of auto-level itself for best traction. The forks are designed to minimize marks on the green. I’m definitely cool with that feature. The greens I play are bumpy enough! A very useful function of these spikes is the wear indicator. You can see the “C” in the middle of the spike. When the spike is worn to the point of needing replacement, the C turns solid. I have yet to see this happen as my spikes are freshly installed, but it is nice to know I have a visual indicator telling me when to replace them. Many golf shoes have different fastening systems. The Scorpion Stinger is available for shoes using Small-Thread, TRI-LOK and Q-Lok systems. The set I changed out were Tri-Loks, and they solidly click in with a fraction of a turn. Changing out my old spikes was easy, once I got my hands on a decent tool. I’m now enjoying superior traction over what I had previously. My feet are no longer slipping. I’m also noticing some extra power/distance in my shots. My base is much more solid. Check your spikes. You may be losing some performance, distance and accuracy if they’re worn. I did and now I’m benefiting from more power and control, along with better stability. The Stingers have been great so far and I’m glad I have them installed. It will be interesting to see how long they last. These spikes are definitely a good choice for replacing old spikes. I use these spikes in every pair of golf shoes that I have. They provide the best grip and stability during the entire round. They also have the best durability. These spikes come in most every FootJoy shoe, which is the best shoe on the market. If FootJoy puts these spikes in golf shoes then you know it is a good product.